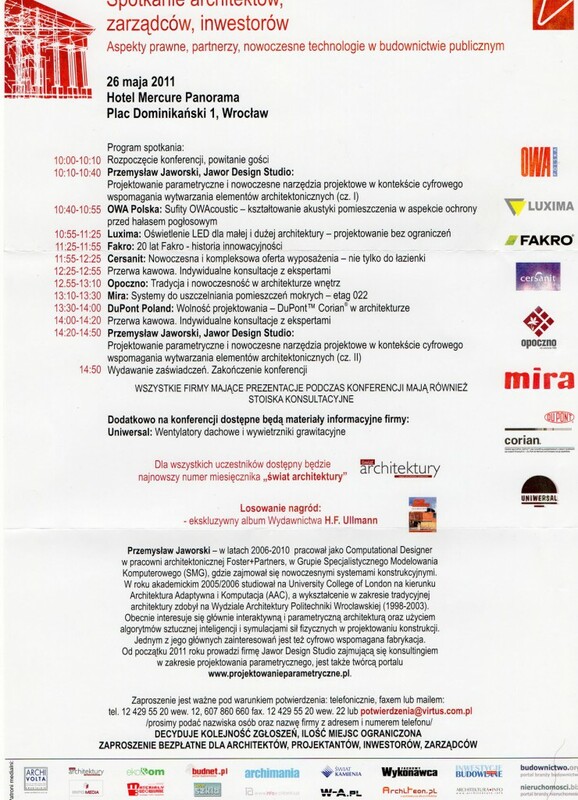 Przemek will present during architectural conference in Wrocław, Hotel Panorama. Presentation will cover various aspects of contemporary computer-aided design techniques, especially focusing on generative and parametric approach in context of fabrication of architectural components. Other presenters will include companies such as OWA Polska (acoustics), Luxima lighting, Fakro (windows), Cersanit (ceramics), Opoczno (ceramics), Mira and DuPont Poland (corian). More information can be found on Virtus website or on facebook. This entry was posted on Sunday, May 15th, 2011 at %I:%M %p	and is filed under presentations. You can follow any responses to this entry through the RSS 2.0 feed. You can leave a response, or trackback from your own site. i nie wyobrażam sobie roku, żeby nie pojeździć. Goraco pozdrawiam i czekam na więcej. Great info. Lucky me I came across your site by accient (stumbleupon). this post reminds mme of my previous room mate! however I know I am getting know-how all the time by reading such nice posts. Wow! At last I got a webpage from where I be capable of truly obtain useful data concerning my study and knowledge. a difference in performance. If the vehicle is parked overnight. like what you’ve received here, really like what you’re saying and the way in which you are saying it. The words in your post seem to be not viewable on the screen in Firefox. blogger lovers but this piece of writing is truly a nice post, keep it up.